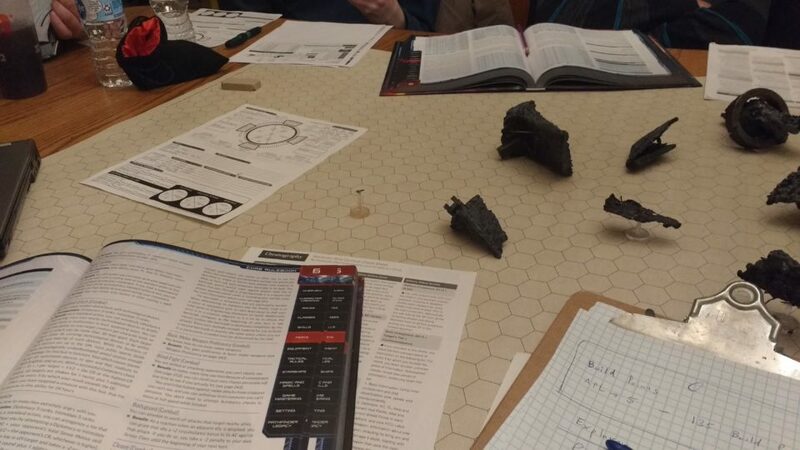 Our last Starfinder Dry Run went great until the group stole a frigate and we slammed straight into a steep learning curve. 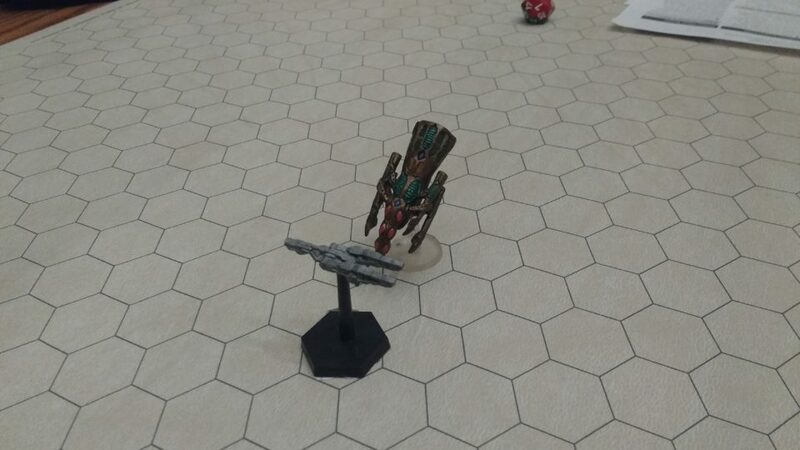 I really like that Paizo didn’t take the cheap route of making starship combat a scaled up version of the on foot segments but…we really weren’t prepared for it. That’s why round two was all about starships! It took the group about an hour and a half to build their starship. It was definitely the right call to start with this instead of just handing them a pre-built starship like I did this time. One reason it took so long is that we went, step by step, through the equipment options and basic rules related to them. I think this process, along with a handy cheat sheet, is what really set us up for success in the session. 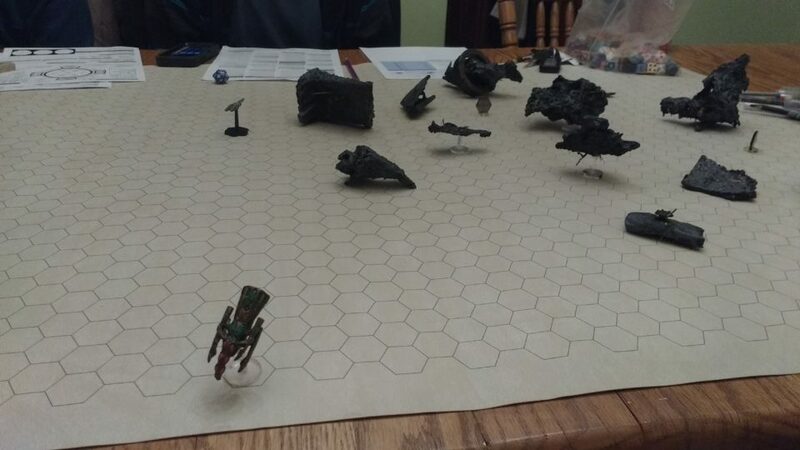 They started off with a one on one starship battle against a Tetrad Caravel represented here by the Hive Devastator. However, since they knew this was going to be a one off to test starship combat they prioritized combat during building. The result is that this encounter didn’t feel very threatening to them – the Tetrad Caravel could only hit them on a 19 or 20. There were still some rules that confused us. The group dodged the nuclear missile I fired at them but two of them failed their fortitude save and were irradiated. We had a hard time trying to figure out what that meant exactly; hopping between the weapon description, the radiation description, and the poison section before finally letting it go for the night. The Tetrad Caravel may not have been a great threat to the players but it definitely demonstrated the utility of a high initiative score. It continually outmaneuvered the more maneuverable player ship due to acting last on the piloting phase. After several rounds of combat it became clear that the players were going to eventually destroy the Tetrad Caravel but also that it would be a prolonged slugfest. Rather than be destroyed, the Tetrad Caravel fled the scene and the players decided to let it go – not that they really could have stopped it, they had half the speed and didn’t equip a tractor beam. Searching the nearby debris field the gunner discovered that shooting the debris with kinetic weapons gave it momentum and the Science Officer located the shuttle that the group was looking for… They had decided that this wasn’t a search and rescue mission but that the pilot owed them 60,000 credits. However, the Science Officer noticed that one particularly large piece of debris had some abnormal readings coming off of it. A closer scan revealed that it was actually a gigantic space whale! At this point they had a lengthy debate over what to shoot. I did not ask why they felt the need to shoot anything. Ultimately, they decided it was a one off so they would shoot the space whale. This was not a wise idea but, hey, they were right that a one off is the right setting to do something like this. Long story short, the space whale chased them and they almost outmaneuvered it…almost… But it ploughed through the debris field and caught them on the other side. First TPKO that I’ve had in a long time…but at least the players now know not to randomly shoot space whales in the campaign proper. All in all, a fun one off and we definitely got a good grip of starship combat. I am a big fan of how different starship combat feels from the one foot sections and the kind of roleplaying it opens. It definitely promotes some fun exchanges that evoke classic moments from Star Wars (“Don’t get cocky, kid”), Star Trek (“Scotty, I’ve got to have more power!”), and Firefly (“Were there monkeys? Some terrifying space monkeys maybe got loose?”).